Planning a movie marathon or an Oscars viewing party? 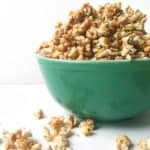 A big bowl of this easy Bourbon Caramel Popcorn makes for a sweet and smoky snack to beat the movie munchies. Popcorn and movies just go together. Although I’m not really a movie buff, I can’t watch a movie without a big bowl or bag of it. 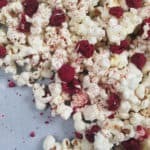 If you doubt my love, you may remember that I coordinated a bunch of bloggers to make popcorn recipes with me last summer. And you’ve seen tons of recipes for popcorn around these parts. 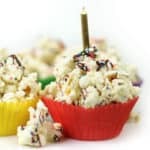 There’s a recipe for you if you like your popcorn spicy, herby, fruity, cookies-and-creamy! 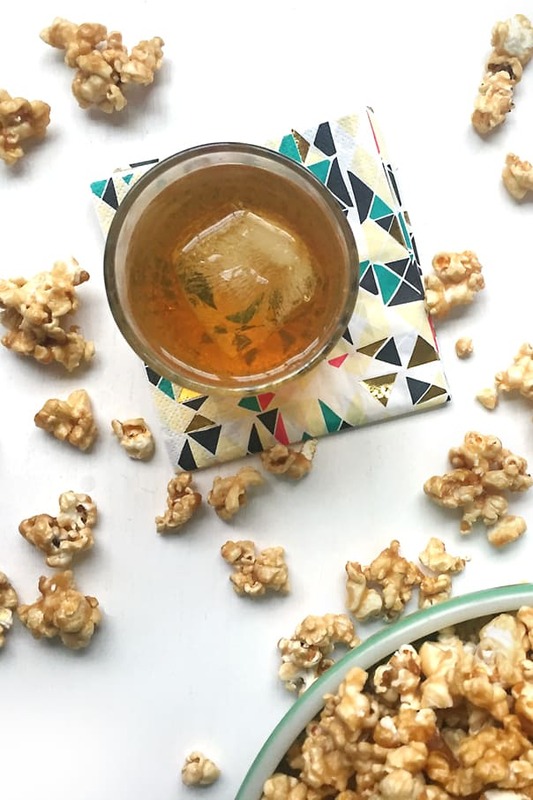 And you can bet your DVD collection that this Bourbon Caramel Popcorn won’t be the last. 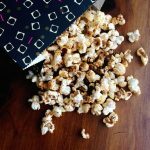 Our family always used to be gifted those big tins of tri-flavored popcorn for the holidays, and we would fight over the last kernel of caramel corn. 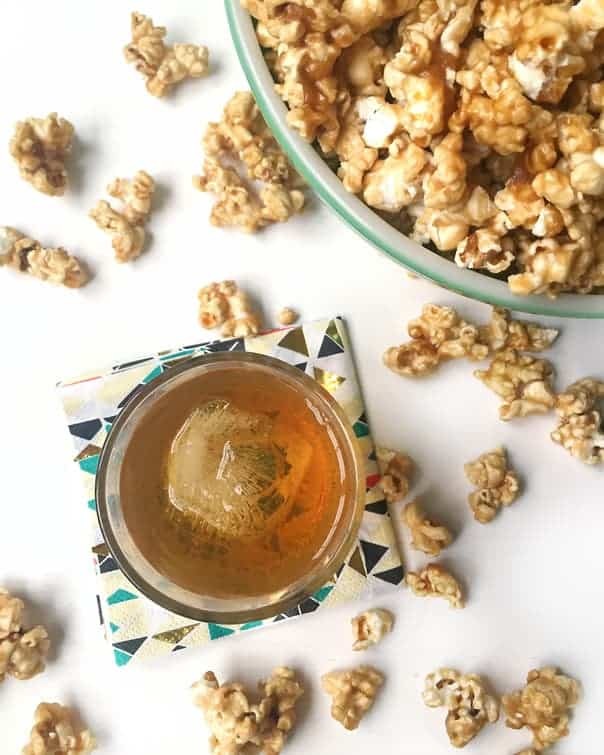 This Bourbon Caramel Popcorn recipe is my current favorite for a grown-up version of that treat. The dark and woody notes of the bourbon are beautifully intertwined with the buttery sweet caramel. So good! 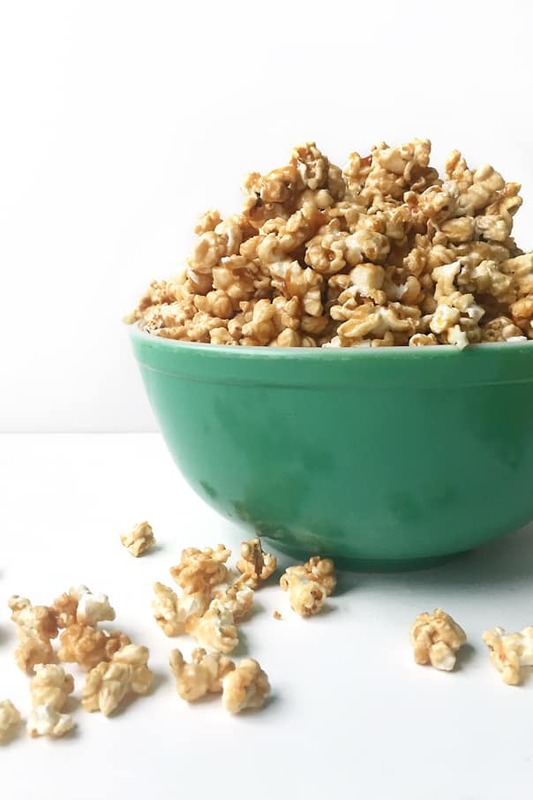 Making caramel corn isn’t as hard as you’d think! I promise. By the way, I finally gave in and tried microwave popping the kernels in a brown paper bag, after years of going the stove route. Serious Eats has a great tutorial and I’m never going back. 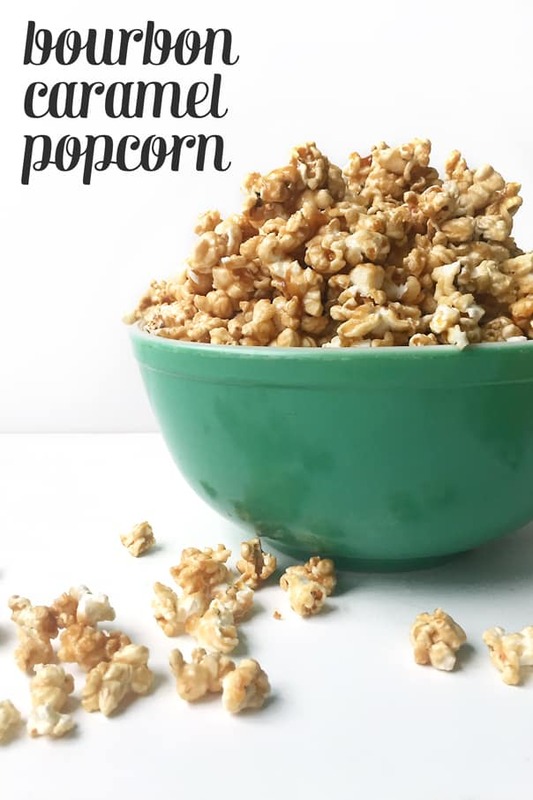 No matter how you pop your corn, plain popcorn is the way to go for this recipe! It is so much more economical to buy a big jar of kernels for $3 than a box of, like, three ‘movie theater butter’ bags for $5. 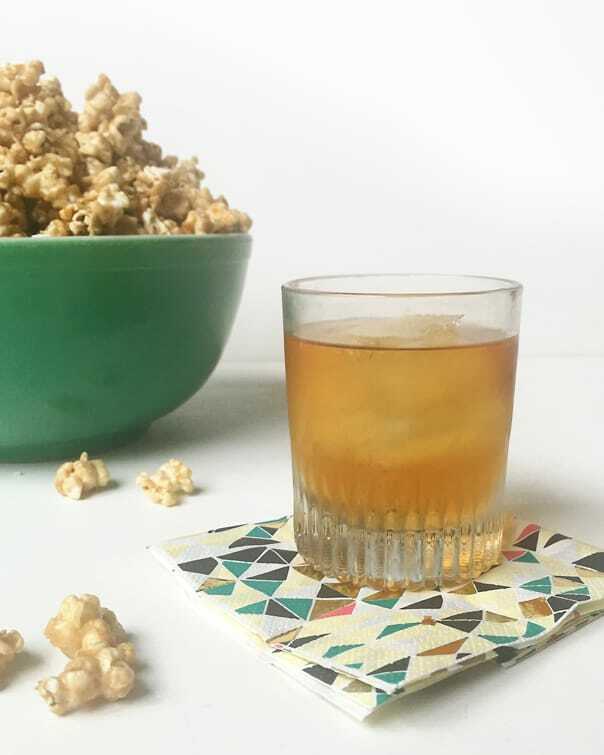 If you’re planning a movie marathon in preparation for the Academy Awards this weekend, or an Oscars viewing party, you definitely need this Bourbon Caramel Popcorn. 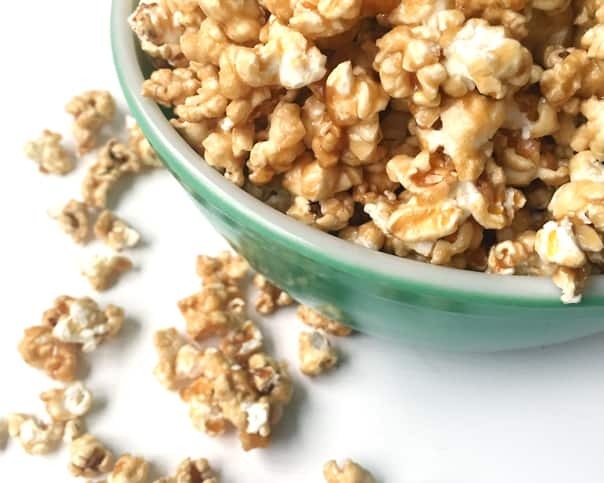 Click through for the Bourbon Caramel Popcorn recipe! If making on the stove: In a medium saucepan, bring 1/4 cup vegetable oil to a simmer over medium-low heat, stirring often. Add popcorn kernels in a single layer and cover saucepan with a lid. When the popcorn begins to pop (after about 2-3 minutes), shake the pot over the heat for about 3 minutes, until popping slows. Remove from heat immediately and let cool. If making in the microwave: In a small mixing bowl, stir together uncooked kernels and 1/4 teaspoon vegetable oil. Pour into a brown paper bag and fold the bag closed. Microwave for approximately 2 minutes (will vary based on the microwave). Remove when popping has slowed. Remove from microwave and let cool before handling. PREPARE BAKING SHEETS. Preheat the oven to 200F degrees. Spread the popcorn out onto 2 large baking sheets. Remove any unpopped kernels. Set aside. MAKE THE CARAMEL. In another medium saucepan, melt butter on medium-high heat. Add sugar, corn syrup, cream of tartar and salt. Stirring constantly, bring mixture to a boil for about 5 minutes. Working quickly, remove saucepan from heat and stir in the baking soda and bourbon. Mixture will become thick and bubbly. Pour the caramel mixture over the popcorn and toss gently until all the kernels are coated. COOL. Remove from oven. Let the popcorn cool on the pan. If desired, break apart any large clusters. Store in an airtight container for up to 2 weeks. Yum! 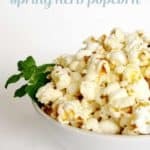 Popcorn is my go-to snack when I’m watching TV or movies at night. This version sounds incredible!